Supposedly, Seattle as a travel destination embodies the funky and artsy. Yet, surprisingly, there are only a handful of hotels that match that reputation. The majority of high-end hotels in Seattle seem stale, corporate, and predictable. Those adjectives are light years away from the Hotel Max. This downtown, Seattle boutique hotel is all about being fun and trendy. 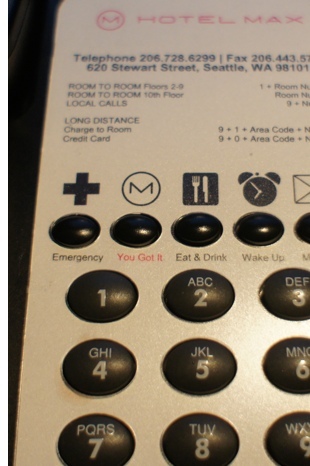 Every room at The Hotel Max comes with a YOU GOT IT button on the phone. The idea being that whatever you need is only the push of a button away. A hotel representative was hesitant about giving us examples of strange requests past guests have made, but literature in each guest room gives you some suggestions of what to ask for. Use your YOU GOT IT button to order soft, medium, firm, extra firm, u-neck or body pillows. Guests can ask for an iPod, pre-loaded with a particular genre of music, to play on the in-room iPod docks . And if you are feeling contemplative, you can ask for a book from the “spiritual menu.” The Max, being agnostic, can bring you a copy of the Bible, the Bhagavad Gita, The Torah, or What is Scientology?, among others. 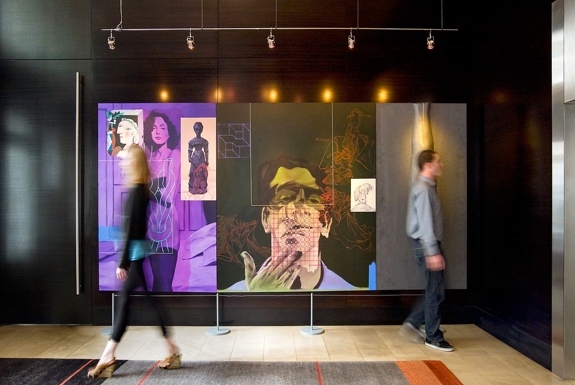 If the YOU GOT IT button is the hotel’s most distinctive feature, its extensive art collection is not far behind. The Max (with 163 rooms) features work from more than 350 different artists. Every room door sports a different artsy photo. All the artwork, along with bios of each artist, can be perused in a copy of the Maximalism book available in each guest room. The Hotel Max also features the absolute perfect level of service: friendly, but not intrusive. And there are lots of nice little touches around. Free gumballs from the machine in the lobby, anyone? The downsides of staying at The Max can mostly be compensated for. The hotel gym is rather small and basic, though they’ll set you up at a nearby gym if you ask. The attached Asian-fusion restaurant is hopping for lunch and dinner but isn’t breakfasty—either walk to a nearby option or order room service. As for the relatively small size of the queen rooms, consider spending a few dollars extra upgrading to a King Parlor (315 to 352 square feet) or Art of Two Beds (335 to 395 square feet) room. Regardless of what room you choose, you can fulfill your image of this funky, artsy city by taking your next Seattle stay to the Max. Great article! The facilities look incredible. I especially like the paintings. Just outside of Seattle, the Mill Creek Hotels provide nice accommodations as well. Wow! Loved the paintings. The Hotel Max sure do stands out. karl david recently posted..Hello world! Love it! I would love to work at a hotel like this after I finish my hospitality degree at Kendall. I think this is a future trend for hotels. Hoteliers can learn a lot from what The Hotel Max is doing here. Thanks for the great article. “Queen of Art” room a feelings of rhythm which is a concept of poetry. I like this theme for beautiful life as tourist. Thanks for your nice post.